The LG G3 has finally arrived, ushering us into the era of super high-res, Quad HD (2560 x 1440-pixel) displays, and what LG calls “smart simplicity”. LG, however, has worked on making its G3 a beast not only on the inside - outwards, the 5.5-inch handset looks surprisingly compact, with almost zero bezel, and it’s got a nice metal-like finish and curvature that give it an appearance resembling the premium HTC One (M8). What’s the LG G3 all about, though? We have summed up everything that you need to know about LG’s new flagship darling, along with specs, price and release date. May 27, 2014, 12:01 PM, by Chris P.
May 27, 2014, 6:37 PM, by John V.
May 27, 2014, 12:08 PM, by Chris P.
May 27, 2014, 12:42 PM, by Victor H.
The LG G3 builds up on the solid base of the G2, with similarly positioned buttons on the back and no physical keys up front. LG listened to feedback from customers and replaced the glossy plastic of the G2 with a matte finish on the G3, though, and this should contribute to less fingerprints on the back of the phone. Moreover, LG has put what it calls a ‘metallic’ layer on the back of the phone and has graced the G3 with a brushed-metal like look, but at its core the material used is still polycarbonate. Probably the biggest change that you’d notice immediately is the new interface that the LG G3 rocks. It’s still very colorful, in the best traditions of LG’s Optimus skin, but this time with a preference for pastel tones, with a bit toned down appearance, and round and flat icons. LG claims it draws inspiration from its own logo winking circular for this new look, and at first look the change definitely looks welcome. LG also introduces quite a few new features in the G3. Smart Notice, for instance, would remind you about missed calls that you have not returned. LG's new Smart Keyboard also comes with rich customization options - you can resize it and it learns faster from your typing. There's also the Smart Security features including the improved Knock Code and Content Lock that hides your private files from prying eyes. One of the coolest sounding new features of the LG G3 is its laser auto-focus. Apart from the cool factor of having laser anything in your phone, the IR laser beam actually helps the G3 achieve the fastest auto-focus of any smartphone so far. LG nailed the point in its presentation, saying that it’s faster than competitors (cough, Galaxy S5, cough) with 276ms auto-focus. The 13-megapixel main camera of the G3 also makes use of optical image stabilization plus (OIS+) tech that we saw in the G Pro 2 phablet. LG's QuickCircle case is sold separately. We’ve already seen how much more stable videos shot with it look compared to the G2, so the evolution here is also substantial. LG introduces a bunch of new accessories with the G3, but it's the QuickCircle case that really captures the eye. It's the first time we see a round cut-out for quick-peek operation of a phone, and in the G3 the number of things you can do from this tiny window (and without having to flip off the cover) is much larger. You can not just control music - you can also open the camera, call and text people, see your step count for the day, and access settings. May 27, 2014, 4:29 PM, by Chris P.
May 27, 2014, 4:15 PM, by Daniel P.
May 27, 2014, 4:09 PM, by Victor H.
May 27, 2014, 12:24 PM, by Daniel P.
May 27, 2014, 12:09 PM, by Victor H.
May 27, 2014, 12:09 PM, by Daniel P.
May 27, 2014, 12:20 PM, by Chris P.
After reading about all the cool features of the LG G3, you might be wondering when and where can you get it. Unless you are lucky enough to live in Korea, where the phone launches tomorrow, on May 28th, the rest of the world seems to be getting it in late June and early July. 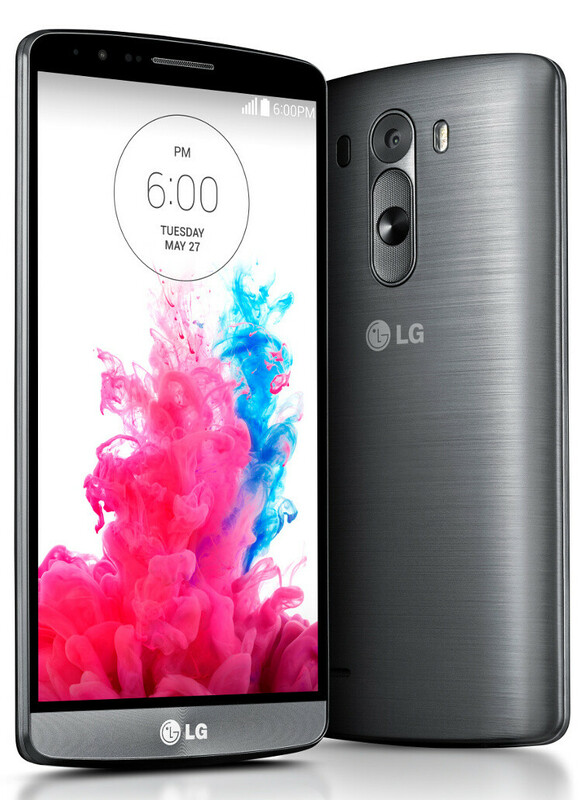 The LG G3 price is said to be a surprisingly low for its class $549 off-contract (but this can vary), but we still expect it to cost no less than $199 on contract in the United States. At least in the beginning! Below, you’d find a list of carriers and retailers who have confirmed they will carry the new LG G3. 16gb storage = 2gb ram, 32gb storage = 3gb ram.. LG I salute you! The design of the phone is simply stunning! And the rest is innovation! There are more useful features in this phone than the gimmicky heart rate monitor! Wish it had a bigger battery though to push the Quad HD resolution. My Z2 is going to stay, but my other phone is probably going to be replaced by this beast - waiting for camera and battery tests! I wonder why do you have to bring Samsung in all your comments? Because they're LG neighbouring competitor, aren't they? 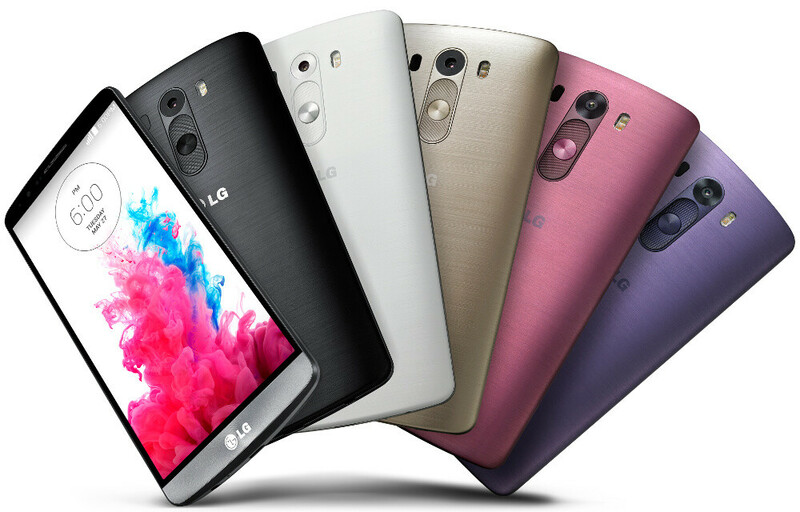 G3 reminds me so much of the M8 in so many aspects... except the pink and purple colour..
Definitely not in the bezel and camera category... But yes, It does have some striking similarities with the One... Being that it's an excellent smartphone in 2013. I'm a Note 3 user and I am super impressed of what LG did with G3. I am waiting to see reviews and maybe I will sell my Note 3 and buy G3. Maybe they should have added a better camera but the screen definetly took my attention.Great job LG ! Choices Choices, I have a note II myself and have been in the market for a new phone, the LG Pro 2 looks amazing but I don't see it coming in to my carrier anytime soon. On the other hand the G3 is pretty much confirmed to come in however I would like an increase in screen size. I still believe my Note 3 is the best smartphone around, but this beast is just impressive! I'm looking forward to read the opinions by non biased professionals. I do expect only the best comments in reviews but it really has to be revolutionary to make be buy it. We'll see! Gonna be the sexiest phone out there, though I'm not really fan of that weird back button placement. They're doing great despise no SD805 available. 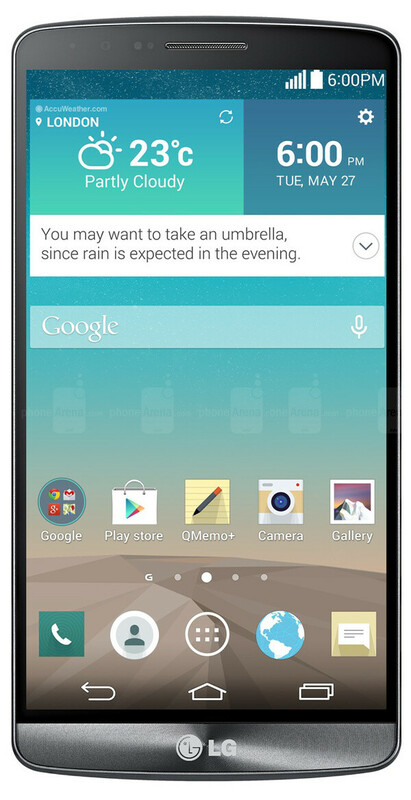 The LG G3 3GB RAM edition is available CMIIW. The year of the LG Era 2014!!!! It's not water proof so a no go area for me and for so many others. Great phone, great design, great specs, great features. I'm especially pleased with the software development LG has made. The new software design is just my style: simple, elegant, clear but tuned down colours, no cartoony look whatsoever. Much like the great design philosophy of stock Android kitkat. However, why, just why, do they continue making them bigger and bigger? I need a phone not a tablet, there is no way this will fit in my pocket. What is the point then? I also need to question the ram. Who honestly really needs 3 gigs in a phone anyway? Well One thing is for sure. If this phone has a brand name like Samsung/HTC it would have shattered all previous records. Same was the case for G2 as it was very much superior but didn't got as many sales as that should have. Hopefully G3 is going to change that. I have one doubt about the QHD that well Adreno 330 stand tall for it? Same is the case for 2GB RAM (16GB versions). As the Android is still not well optimized. I download a lot of apps and music onto my phone and I'm hoping AT&T or Verizon will have the option between 2 or 3 gig of ram. When it will be available in market?I'm waiting.